Standort: 2: Superconducting Radiofrequency Acceleration . 2.1: BMBF Verbundprojekt R & D Beschleuniger 2015 -2018 . 2.2: BMBF Verbundprojekt R & D Beschleuniger 2013 -2015 . Superconducting radiofrequency cavities operating at 1.3 GHz have seen a tremendous development in performance since the launch of an intense R&D effort in the early 1990s. 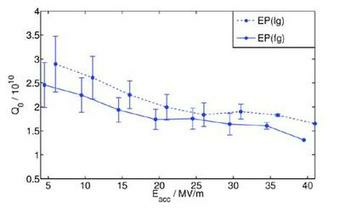 At DESY the TESLA collaboration has advanced the accelerating field to average values of roughly 28 MV/m and losses of about 12 nΩ and peak performance values of 45 MV/m or minimal losses of 6 nΩ. The International Linear Collider (ILC) has specified a gradient of 35 MV/m as an acceptance test in the vertical cryostat. Such fields and higher have been shown to be attainable in cavities, but this needs to be translated into a large scale production. A dedicated R&D on the first large scale industrial production of cavities was carried out to optimize the process and increase the yields. 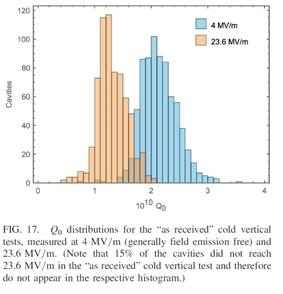 The production specification for the 800 cavities of the European XFEL was an minimum field of 23 MV/m at a quality factor of 1x1010 (equal to 27 nΩ). This first industrial fabrication of cavities resulted in the largest sample for systematic performance characterization leading to the largest superconducting linear accelerator ever been built. The design specifications were more than achieved and a great success (see yield plots below and two cavities performances from the production). 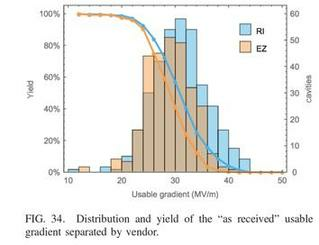 Yield and distribution of the maximum gradient (left) and quality factor at two different gradients (right) of the European XFEL cavities. These world class results – as a consequence of world class R&D – bring DESY into a unique position with the gained knowledge and infrastructure as well as well-trained specialists. - the highest Q0 under established and reproducible production conditions. For this, two topics are identified. A recent – by American colleagues – discovered process showed that baking a cavity and injecting a certain amount of nitrogen into the furnace, the losses drop by up to a factor of two. 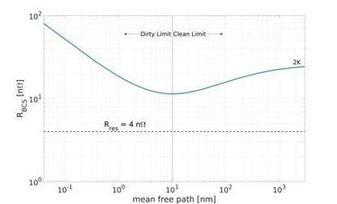 No consistent explanation linking the surface structure to RF parameters is available, neither for standard nor these baked cavities. The R&D pursued here is based on two approaches: Identifying an optimal recipe wrt. to the resulting surface and the RF performance and develop a fundamental understanding of this effect. Nitrogen as an interstitial has an influence on the mean free path, but it is unclear – and disputed – that it should be the only gas to achieve such a reduction of losses. Furthermore, it is not clear if different phases are formed, hence changing the fundamental structure of niobium in the relevant layer. In-Situ XRR, XRD, SEM, TEM, EDX and XPS measurements are done, beamtimes at ESRF and PETRA are used and a new test resonator to obtain RF parameters of samples is under development. European XFEL cavities are made of niobium sheets with a grain size of approx. 50 μm. So called large grain material has grains with a diameter larger than 1 cm. Besides reduced costs during the fabrication – due to less machining steps – and less impurities in the material because of less machining steps, cavities out of that material showed interesting RF behavior. Quality factor vs. gradient of large-grain (dashed) vs. fine-grain (solid) cavities after standard XFEL surface treatment. Large grain niobium cavities results in ~20% higher Q0-Value on average compared to fine-grain cavities with the same treatment. 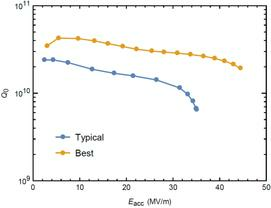 Furthermore, a European XFEL pre-series cryomodule with 7 large grain cavities shows excellent results with ⟨ Q0 ⟩ = 3×1010 at 17 MV/m and 2K, which is the design specification of the LCLS-II machine currently under fabrication at SLAC but follow a dedicated process recipe with higher failure risk.